You’re probably thinking I’m about to list my all-star tool picks. Nope. 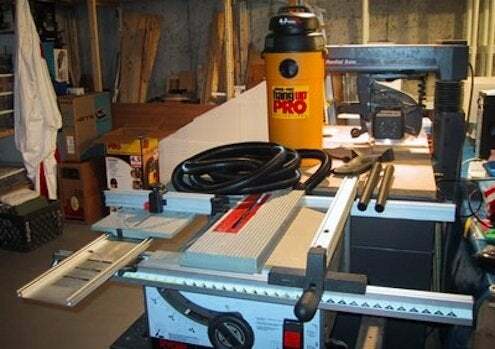 My five must-haves for a basement workshop have more to do with comfort, health, and safety. If you want to enjoy spending time in your shop—and protect your investment in tools—I think these items are truly essential. The ideal dust collection system would allow you to move freely from band saw to sander. Unfortunately such a system takes up a lot of space and can cost hundreds of dollars. A budget solution is to buy a good shop vac, attaching it by hose to your dust-producing tools. For convenience, buy a vac with a built-in power-activated switch that engages the vacuum automatically once the tool has been switched on. If you already own a shop vac or don’t want to buy the high-end model with a built-in switch, consider an add-on tool-and-vac switch (e.g., the i-Socket Autoswitch from DGC Products). No matter what dust collection system you have, wear a dust mask and provide for adequate ventilation when using dust-producing tools. A sink in the basement allows you to handle messy cleanup chores without traipsing dirt and grime into the kitchen. 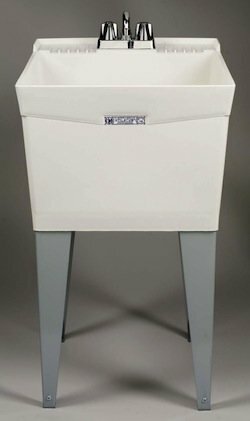 Whether you need to wipe up glue, clean paintbrushes, or wash up for dinner, a utility sink is well worth the investment. Besides, it provides a great place to drain washing machines, high-efficiency furnaces, and the dehumidifier. Basements are often damp, especially during the summer months. Warm moisture-laden air seeps into the basement and unloads droplets of water in the form of condensation. Excess moisture promotes mildew, odors, rot and rust. With a good dehumidifier, you can keep the relative humidity of your workshop below 50 percent. Not only will this keep your prized set of chisels from rusting, but it will also keep the rest of your house dryer and mold-free. Choose a dehumidifier with good capacity and fit it out with a condensate pump and drain line, so you don’t have to manually drain the reservoir every few days. Too few receptacles and overloaded breaker-tripping circuits are a nuisance, and sometimes they’re a hazard. Avoid a workshop where the floor is crisscrossed by extension cords and power strips! Have at least two circuits installed in your shop along with plenty of receptacles. Put lights on a separate circuit from your power tools; that way if you do trip a breaker you won’t be left in the dark. Most shop tasks require standing, and no flooring is quite so uncomfortable as concrete. In addition to being hard, concrete is cold and often damp. 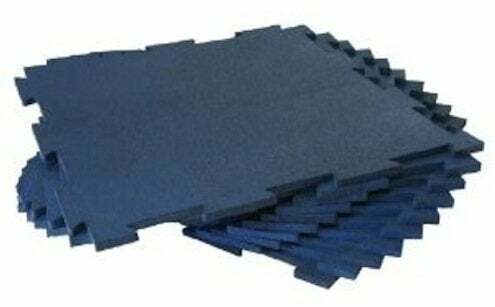 Modular interlocking floor tiles can be installed on your shop floor quickly and easily without adhesives. They offer cushioning for your legs and a thermal break between your feet and the slab. The tiles also form a vapor barrier. Made of vinyl, polypropylene, or rubber, they are easy to clean and in the event of flooding, they can be removed, cleaned, and reinstalled. There are many other must-haves for a basement workshop, including good ambient and task lighting, ventilation, and an electric radiant heater–and, oh yeah, tools!